In Mythologies, Barthes hinted that fashion magazines might provide a ready field for semiological analysis. In The Fashion System (published in France in 1967), he appears at his semantical worst--and, ultimately, some of his perceptive best--analyzing the written fashion descriptions in Elle and Le Jardin des Modes, instead of their visual presentation, because "it is not the object but the name that creates desire; it is not the dream but the meaning that sells." He divides clothing items and details into "species" and "genera"; he takes seemingly innocent phrases such as "prints win at the races" and finds hidden transformations occurring from the rhetorical code to the terminological to the vestimentary. Fashion signs can contain explicit references to the world or implicit references to the ideology of fashion itself. In the first instance, the dominant metaphor is work, the curiously inactive activity of dressing up. "To dress in order to act is, in a certain way, not to act, it is to display the being of doing, without assuming its reality." When it is fashion itself which is signified, it assumes the guise of natural law, imperative and agentless. "What is decided on, imposed, finally appears as necessary. . . for this to take place, it is enough to keep the Fashion decision secret; who will make it obligatory that this summer's dresses be made of raw silk?" 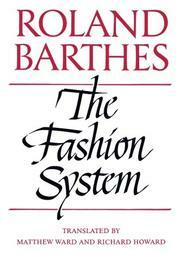 Thus, answering his initial question, "Why does Fashion utter clothing so abundantly," Barthes succeeds in revealing how fashion language draws a veil around the fashion object, "a veil of images, of reasons, of meanings; a mediating substance of an aperitive order. . . substituting for the slow time of wear a sovereign time free to destroy itself by an act of annual potlatch." Linguists may appreciate his precise dissection of codes and matrices; most other readers may suffer through the semantics to enjoy the closing and far more anarchic perceptions.